Made in the shape of a flying dove, this seasonal sweet treat's original name is ‘Colomba di Pasqua’, which is Italian for Easter dove. Traditionally made on Good Friday, it is eaten all over Italy at Easter. Baked in a similar way to panettone (Italy's famous Christmas cake), Colomba is delicious served with fresh red berries and cream or drizzled with melted chocolate for a moreish dessert. 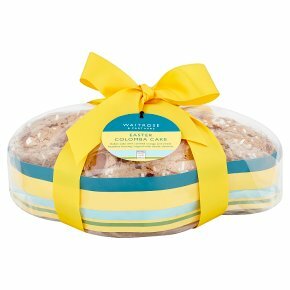 We were the first supermarket to sell Colomba - we only wish we had discovered it sooner. INGREDIENTS: wheat flour, sugar, candied orange peel (18%) (orange peel, fructose syrup, sugar, acidity regulator (citric acid)), concentrated butter (milk) (11%), pasteurised free range egg yolk, yeast, pasteurised free range egg white, hazelnuts (2%), almonds (2%), emulsifier (mono- and diglycerides of fatty acids), milk, rice starch, invert sugar syrup, salt, rice flour, flavouring. For allergens, including cereals containing gluten, see ingredients in bold. May contain: peanuts and may contain other nuts.